The Vimdiff vanity mirror illuminates with natural LED light to give you just the right amount of natural light you need to look your best. 10X magnification is great for everything from touching up make-up, removing contacts, putting on lipstick, eyeliner, eyebrow tweezing, contact lens placement, mascara, eye shadow or any other viewing needs. Why choose Vimdiff LED Makeup Mirror? 1. Space Saver - Our mirror takes up zero precious counter space. Attached it to your existing mirrors or any surface that is smooth, non-porous and flat. 2. Cordless & Portable - No more dealing with messy cords and searching for an outlet. The rotating arm folds up compactly and neatly. It's ideal for home and travel. 3. Natural Daylight LEDs - Longer lasting and brighter than conventional incandescent bulbs. Our mirror diffuses the light from 14 LEDs to illuminate your face. 1. Prior to mounting, clean surface with soap and water. Any dust or grime will prevent proper contact with the suction cup. 2. Your mirror uses an unique suction locking cup that is more powerful than a regular suction cup. It does not require any glue, tape or silicone. 3. Check to make sure that the suction lock is not already engaged by twisting it counter-clockwise. 4. Press the suction lock against the surface and activate the locking mechanism by twisting clockwise. Adding a little bit of moisture will also help to create a stronger suction. If you have any problems, please do not hesitate to contact Vimdiff customer service. 10X Magnification & Natural Daylight LED: Provides extra light during your grooming routine and allows you to focus on a specific section of your face to achieve a professional finish; Ideal for applying makeup and other beauty treatments that require more precision extra precision, such as applying contact lenses and eyebrow tweezing, precise tweezing, shaving, hair styling and facial care. 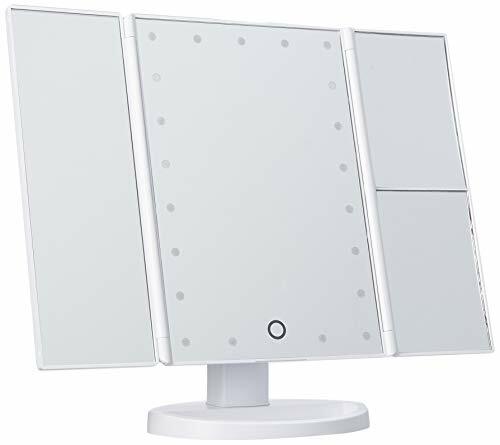 360 Rotation & Powerful Suction Cup : 360 rotation helps to adjust to any desired angle or position; strong suction cup locks your mirror securely onto any clean, smooth, and flat, clean surface with ease; such as on a table, wall, window, and even a larger mirror. 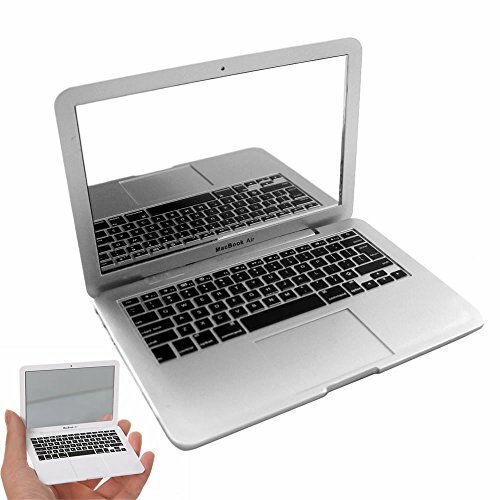 Compact & Protabel Travel Ready: Take this cordless mirror with you wherever you go. Bedroom or bathroom, vanity or wall, this mirror suctions easily to any Flat & Non-porous surfaces like glass, granite or marble; It's perfect for travel too, folding up for compact storage. 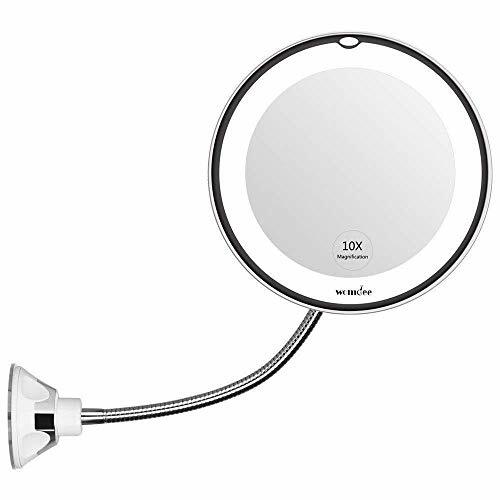 Convenient ON/OFF Switch: Slightly press the ON/OFF button at the top of the suction mirror to turn light on or off, suitable for women makeup or men shaving. LIFETIME MONEY BACK! 100% SATISFACTION GUARANTEE - Vimdiff is your best choice. We remove all risk. You have absolutely no need to worry about getting a dud product as we promise to return your money if you are not happy with your purchase. large mirror excellent for shaving! * Product Size: 11*7.3*3.9 inch-- The entire height is 11" tall. 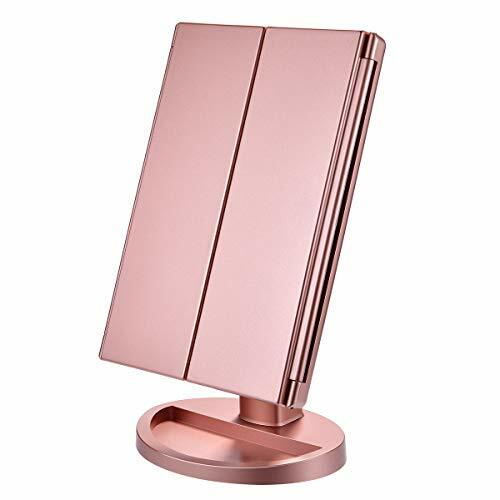 Middle mirror is 9.5"x 7"and Double Side Mirror Dimension is 9.5"x 3.2"
Power: USB chargeable or 4pcs AAA battery powered (battery not included) Voltage: Only fits with power adapter DC5V/0.5A-1A-2A or you can connect with your other devices like PC, power bank with standard usb interface. We are concerned about every customer, if you have any questions, please don't hesitate to contact us. 2. When you don't need it, please turn off LED light after makeup. With its extra-long 11.5 inch extension gooseneck,you don't have to climb onto the vanity to get up close to the mirror,you can adjust the height via the goose neck.No need to bend down now! Our KEDSUM 10X magnification in large 5 inch actual mirror size allows you to see every detail of your entire face. 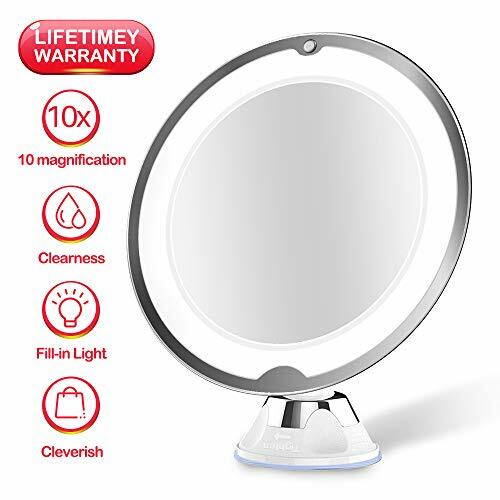 The soft LED light produces bright light to light up the natural color your entire face.It is a perfect makeup mirror for you to put on lipstick, eyeliner, mascara, eye shadow, or use other grooming items. 40% brighter and 60% less energy than incandescent bulbs. Our mirror is equipped with 14 energy-efficient environmental Daylight LED beads that will brighten your face, and provide you with most natural daylight for the most natural look . Our strong Easy-Lock suction cup allows you to securely attach this mirror on any clean and flat surfaces in the bathroom. It takes no more than 3 seconds to install this mirror. Simply attach, twist, and lock the mirror in place. You can easily unlock the suction cup with a simple counterclockwise twist. It is a perfect makeup mirror, you can bring it with you on your next trip and it will take up less than 1/2 sq ft. in your luggage. - This is a magnifying mirror,so you would have to hold it close up to 5 inches from your face to see a clear image. 11.5 inch Adjustable Flexible Bendable Gooseneck , you don't have to climb onto the vanity to get up close to the mirror,you can stand up in front of the vanity and adjust the height via the gooseneck to find those perfect viewing angles every time! The purpose of the 10X mirror is to magnify and see more detail, and this kind of mirror work well only when you get close to it. The recommended distance for using the mirror: 2~3 Inch. 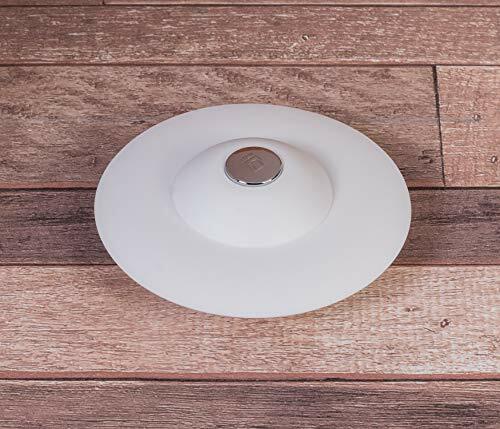 360 rotation with locking suction cup provides a secure attachment; fully adjustable to any desired position. Note: This is only a 10X one side mirror, not a double side mirror.tion with locking suction cup provides a secure attachment; fully adjustable to any desired position. Note: This is only a 10X one side mirror, not a double side mirror. Natural daylight LEDs that will last for 50,000 hours and provides the natural light you will encounter throughout a day. Suitable for all ages. Do not need too strong magnification? 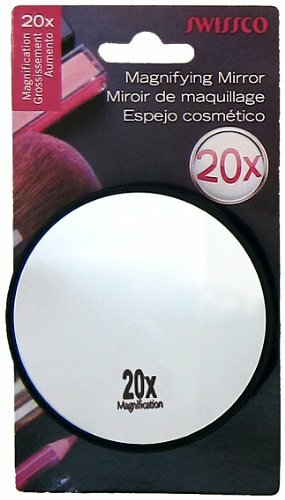 you can choose the 7x mirror for the better makeup. Powerful 10X magnification with 14 bright LED lights allows you to focus in on a specific section of your face - ideal for makeup applications and precise tweezing.Great for those with poor eyesight or want to focus in on every pores without distortions! Cordless, portable, and operated with 3 AAA Batteries (not included),when folded, takes up less than 1/2 square foot of space, which makes it a perfect travel mirror too. (only 16oz). 100% SATISFACTION GUARANTEED for ONE YEAR. You will not regret this purchase! Adds a dual function to any table or wall mirror. Ideal for Make-up application, contact lense insertion, eyebrow tweezing, or hair removal. Available color will be shipped. 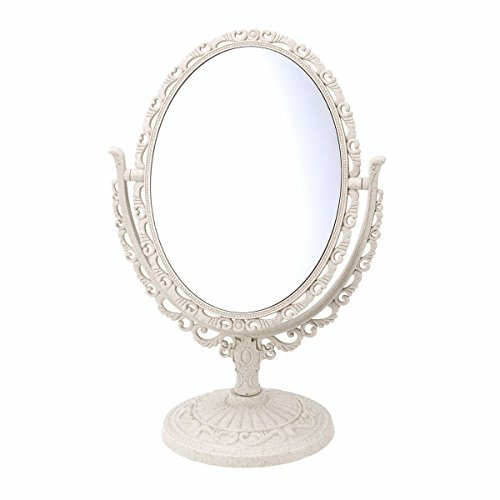 Silver, white or black 20X magnification mirror is perfect for times when you need a very close up look in the mirror. High quality, durable glass. Strong suction cups stick to other mirror or any smooth surfaces. Ideal for travel or purse. 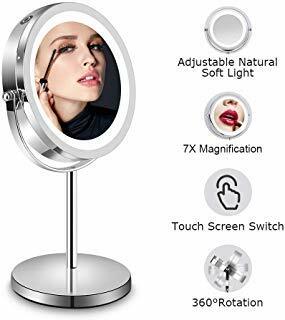 Zoom In Every Detail Of Your BeautyThis magnifying mirror is a useful tool for women makeup application and men s shaving since it is featured by 10 times magnification on one side and regular on the other side. It allows detailed work such as eyebrow tweezing, contact lens placement and mascara application. It is useful to observe pores and blackheads. 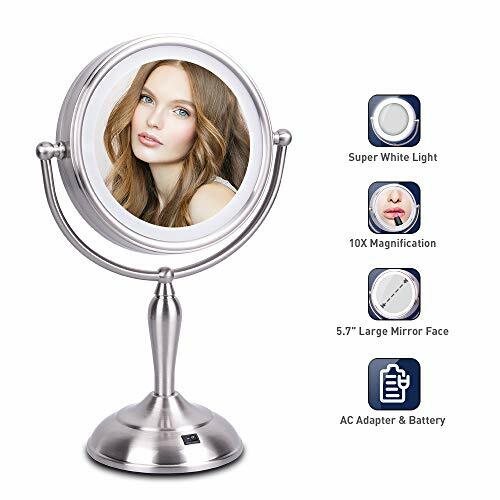 This magnigying mirror provides clear vision for any grooming or make-up use.Power Up The Light Wherever You GoThis LED makeup mirror can be operated by 4 AA batteries (not included) or by plugging the original adapter into a socket. The power of this LED mirror can be controlled by the toggle switch. 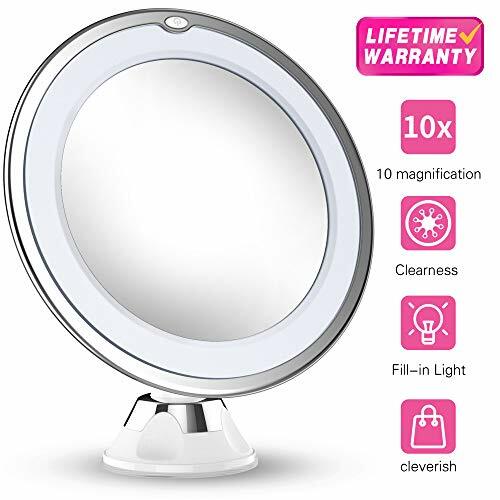 You can travel with it in any country since there is no need to worry about different voltage standards in various countries.Stay Flawless All Day LongThis LED makeup mirror contains 16 built-in SMD and provides bright and uniform light. Circular light source around the mirror obtains shadow-free reflections even in an environment that is lack of light. Natural white light help reflect true colors and shows how your makeup will look under day light. Uniform light around edges casts soft glow and illuminates your whole face. 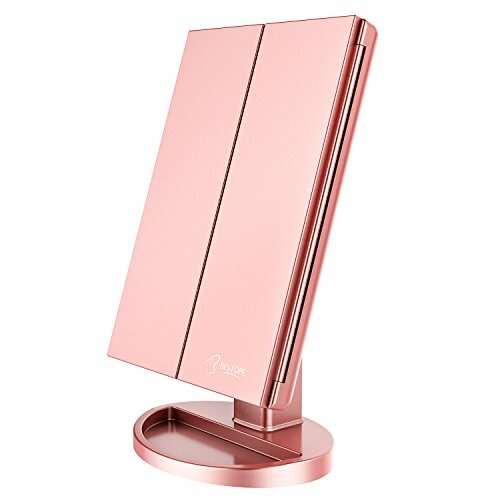 This LED mirror helps you look perfect the whole day.360 Degree Rotation To Find The Best Angle Of YouOur double sided mirror is featured by 360 degree of swivel rotation. It can be adjusted to the angle of your choice. You can fix the angle to an optimal point for the ease of use when undertaking beauty and grooming tasks. Your Modern Elegant CompanionThe elegant and modern look makes it a wonderful addition to bathrooms and bedrooms. This vanity mirror does not take much space and can be placed on any size of vanity table. The compact design also makes it a good travel companion. Expecting more detailed viewing for delicate makeup look? 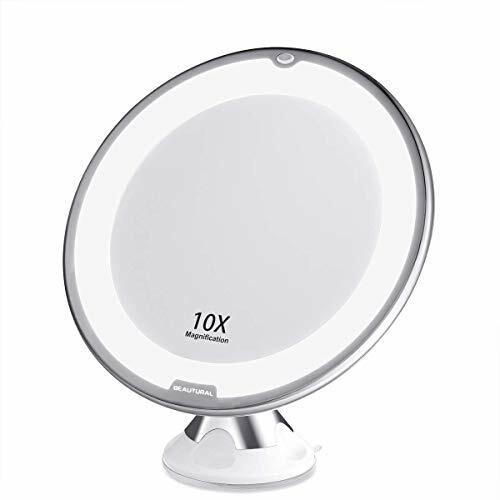 This lighted makeup mirror offers 7x magnification with surrounding LED lights to bring you clearer vision for makeup application at any time. EASY TO GET YOUR FLAWLESS MAKEUP LOOK-Never let unclear viewing ruin your makeup look. This LED vanity mirror has double sides. One is 1x usual makeup mirror and another is 7x magnifying mirror. The magnifying mirror can help you zoom in all the details. With 360 rotation design, it also allows you to find the perfect angle for better makeup application. 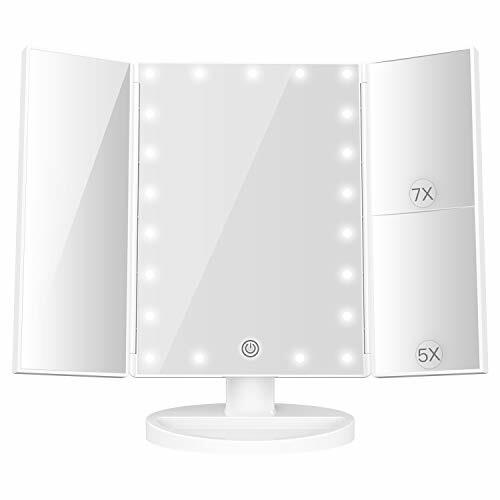 NATURAL BRIGHT LIGHT BOOST YOUR BEAUTY-Along with 28 LED bulbs, this vanity makeup mirror is powerful to provide you natural and bright led light than any other makeup mirror can achieve. It can help you to see yourself clearly in poor brightness environment and reflect in real color. 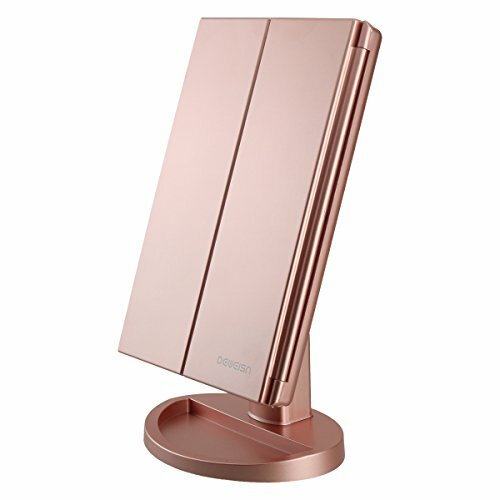 TABLETOP MAKEUP MIRROR & TRAVEL MAKEUP MIRROR-Heavy base makes this tabletop makeup mirror stand steady on the table. 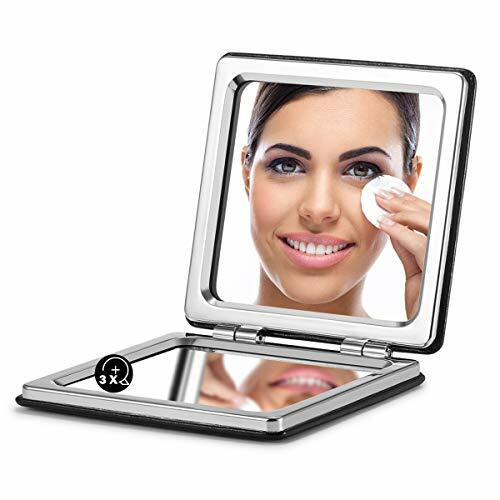 With portable and compact design, it is also suitable to carry on as a travel makeup mirror wherever you go. Only need a little space to place it on and your beauty will stay with you all the time. 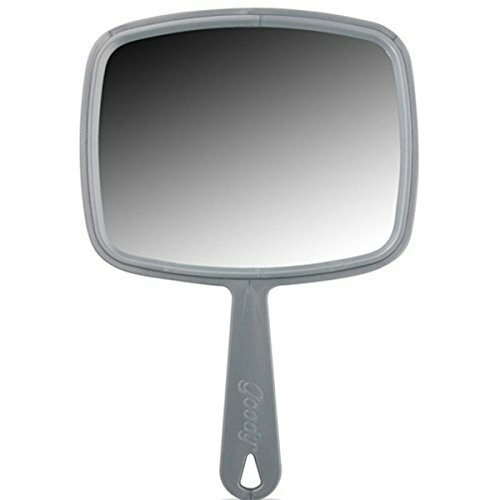 ELEGANT LOOK WITH SUPERIOR QUALITY-The pure silver appearance gives this makeup mirror an elegant exquisite look. Especially the polished chrome finish makes this vanity mirror extremely textured. Place it on your bedroom, bathroom or any vanity area can make your room looks more graceful. 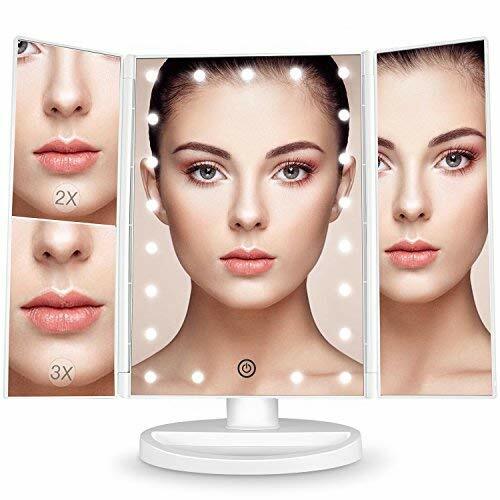 PERFECT COMPLEXION FOR YOUR FLAWLESS MAKEUP - The double-sided led lighted makeup mirror with 1x / 7x magnification is perfect for true viewing and makeup application. 7x magnification function can explore every detail on your face. 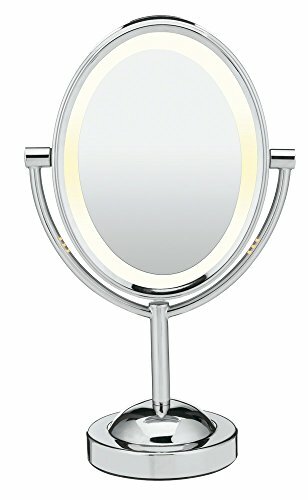 This Lighted Vanity Mirror especially needed when doing eye make up application. Simply and effortlessly rotate to each side and select the best angel. 1x magnification is perfect for viewing your overall look. 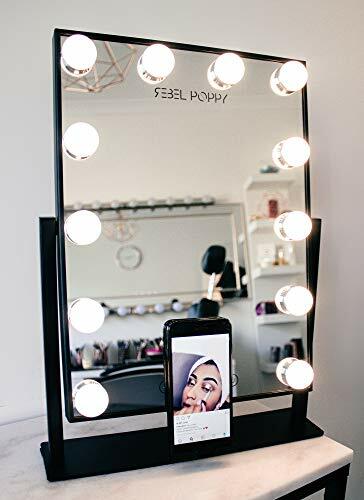 NATURAL SOFT LIGHT BRIGHTEN YOUR BEAUTY - Vanity mirror with 26 led bulbs inside, Eco-friendly and energy-efficient LEDs providing the natural soft light for your natural makeup look. This vanity mirror would reflect the true authentic colors. No matter it is early morning or late at night, it can brighten your beauty under any poor light condition. 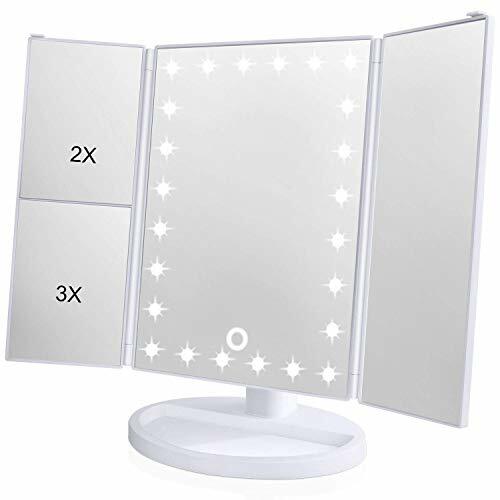 360 DOUBLE-SIDED ROTATION EASY TO USE - This lighted makeup mirror is designed with 360-degree swivel double-sided to ensure that every angle is covered and glorious. Gently spin the mirror and adjust your position to the best angle for the makeup needs. Two sides mirror with 1x and 7x magnification can help you to view the whole look as well more facial features details. Used as eye makeup mirror, eyebrow, beard shave or acne blackhead removal. ADJUSTABLE BRIGHTNESS BASED ON YOUR PREFERENCE - Soft natural lighting for a beautiful, incandescent glow. You can get a clearer sight of your face with concentrated light when under indoor poor lighting conditions. Brightness level can be adjusted as you need. Long press the switch, the light would be controlled to brighter or darker, you can select the appropriate brightness for your makeup application. WONDERFUL TRAVEL COMPANION - With portable and easy-carry design, this vanity makeup mirror will be definitely a perfect travel partner for you. Only need a little space to place it on and you are always ready for the perfect look. 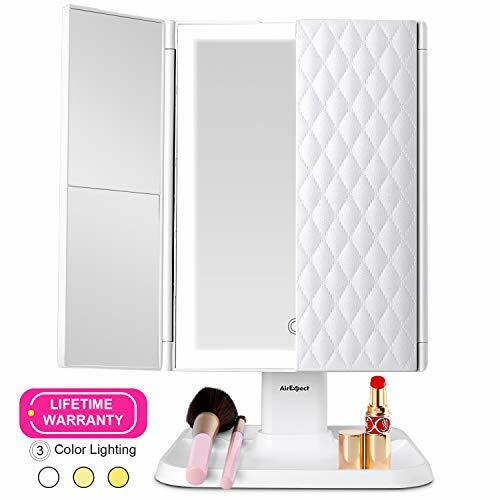 4 AAA Battery operated can get rid of all worries about the power limit, you can finish your flawless makeup wherever you go and let this vanity mirror to witness your beautiful moment. 1. Made of premium PU leather, better hand feeling. 2. HD mirror, no deformation, no distortion, thick with durable. 3. Very sturdy and well protected. 4. Only 0.39 inch in thickness when folded, convenient for storage and carrying. Material: PU leather + glass Color: Black Weight: 65g / 2.3 oz Dimension: 2 " x 2 "
1X PU Hand Held Makeup mirror. There might be slight deviation of product dimensions due to manual measurement. UNCONDITIONAL 60 DAYS MONEY BACK GUARANTEE if you aren't totally satisfied with our selling products. 12 MONTH WARRANTY is offered, for customer satisfaction is our highest priority. We guarantee any question/concern regarding our products or shipment will be replied within 24 hours. Omirro is a vertical website and Amazon store focus only on mirrors, we concentrated on providing high grade moreover cost-effective mirrors for people around the world. SLIM DESIGN: 2.76x2.76x0.39, the small size mirror fit your purse or handbag, easy to carry out for wherever you go.